Do Cats Know There Is a Future? Human cognition is increasingly recognized as not that special among our animal cousins. Numerous demonstrations of other mammals and even birds capable of tool use, of language use, of empathy, and of a sense of fairness permeate the literature. Anyone who spends any time at all with their household pets must wonder at times what is going through their minds. I have generally contended that all animals know about death, at least at a basic level. If they do not know about death, why do they fight for their lives? Conditioning doesn’t begin to explain it. Doesn’t the instinct to live require or create some knowledge at some level of death? But lately, I have gathered some evidence that my cat understands there is a future, perhaps an even more unsettling thought. Heinlein (1957) knew that cats don’t like closed doors. In The Door Into Summer, the protagonist’s pet cat leads him around the house, waiting at every closed door until he opens it. It opens invariably upon Winter as that is the season, and the cat declines to pass through the door into the cold. The protagonist surmises the cat is looking for a door into Summer. This become the premise for an adventure: the hero wakes up in a future he does not prefer, and has to create a new future, a Summer into which he can step. 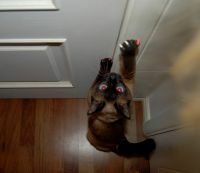 My cat, Misha, also hates closed doors. She doesn’t worry about outside doors—she’s an indoor cat and not equipped for the hazards of the wider world. But if she discovers an interior door closed, she will sit by it and cry, scratch, push, and pull until someone comes along and opens it for her. She will rush through any door that is closing but carefully study any door that is opening. She needs the door open even if she has no intention of going through it. Sometimes she will howl until I open the bedroom door, only to then retreat to her spot under the bed. She didn’t want to go out, she just wanted to know she could if she wanted to. And lately, she is obsessed with the bathtub faucet. Like many cats, she prefers to drink only fresh running water. She will cry and cajole and lead me to the tub so I can turn it on for her, just a dribble. But once it is on, she often then just runs away to her spot under the bed. She didn’t want to drink the water, she just wanted to know if would be there if she wanted it. If I turn it off, she darts out and complains until I turn it on again. She is, in short, preparing for the future. She drives me crazy sometimes with this need for security, especially when she wants me to turn on the water at five in the morning, or three, when my increasingly large prostate causes me to need to get up to pee. You’re awake, she says, now stay awake and make sure the water is on, there’s food in the dish, and all the doors are open. She knows about the future the same way an ex-con knows about the future, hoarding food and other staples. She knows about the future the same as the stress survivor knows about the future, subconsciously driven to check all the exits. She knows about the future the same way I know about the future: in the dark and haunted hours between three and six, when the world is still and silent. The fact that a being does not think in the manner a human thinks does not mean it is non-sentient. Cat sentience has a distinct otherness to it, an alien-ness, a sense that we share the world with other beings of intelligence—a problematic construct perhaps enhanced rather than clouded by extending it to other mammals. Love cats. Love dogs. Love people. Love.